Gary P. Miller is a native North Dakotan, best known for his representations of rural America, especially scenes from North Dakota and Arizona. He studied art in high school and college but is mostly self taught. His work was recognized nationally. In 1982, the Old West Trail Foundation presented Gary with the "William F. Cody Award" for portraying rural America in his paintings. In 2003, the State of North Dakota Certificate for Lifetime Achievement Award was given to Gary in recognition of his outstanding contributions in the visual arts. 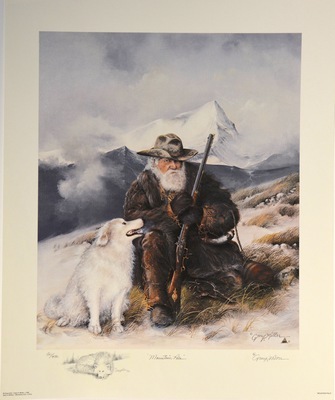 In his "Mountain Pals" series, Miller captures the closeness between a mountain man of the 1850s and his faithful Samoyed husky. Set in the Rockies, the series of four prints shows the results of the artist's period research and attention to detail - flintlock musket, the Victor trap, the beaver pelts. Miller used his son's dog Buddy as a model for the mountain man's companion. The grizzled trapper himself was originally a composite created by the artist at the time of "Mountain Pals I", but after its release a living "twin" turned up in Sedona, Ariz., who has modeled for subsequent paintings in the series.